Climate change activists are glumly anticipating the announcement tonight of Australia's new greenhouse gas emissions target, which many say is sure to be weak and could even dampen hopes for an ambitious global climate change agreement. The target -- expected by many to be in the range of 25 percent below 2005 levels by 2030 -- is currently being debated by key Cabinet officials ahead of a final approval by members of Australia's Coalition, a partnership of center and right-leaning political parties. The goal will be Australia's offering for an international climate change accord. Tony Abbott, prime minister of Australia. Photo courtesy of Wikipedia. Australia is the 13th-largest emitter of greenhouse gases and one of the world's top per-capita climate polluters. Once a leader in addressing rising global temperatures, the government under Prime Minister Tony Abbott has embraced those skeptical of climate science and drawn a protective ring around the country's powerful coal industry. 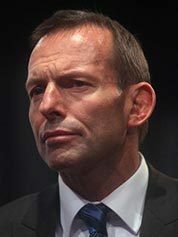 Yesterday, Abbott in a recorded statement reported by several Australian news outlets insisted the government will make a "strong and responsible" contribution to the global climate fight. But he dismissed any possibility of carbon pricing and declared that any measures the government takes must not hurt the economy. "We'll do this without sacrificing jobs or prosperity," Abbott said. "That's why the government will never resort to harmful policies like a carbon tax or an emissions trading scheme." Australia is among the last wealthy, industrialized countries to formally submit targets, known as intended nationally determined contributions, or INDCs, to the United Nations. Those targets will form the core of a new global agreement that will be signed in Paris in December. While targets are expected from developed and developing countries alike, poor countries expect rich ones to take the lead with tougher mitigation plans. John Connor, CEO of the Climate Institute, based in Sydney, said emerging nations that have not yet submitted targets, like India and Brazil, will be watching Australia closely. "A low target will not be great for ambition," he said, adding, "We are the third-biggest exporter in absolute terms, we have a high carbon intensity, and we're a big exporter. What Australia does matters." David Waskow, director of the World Resources Institute's international climate change initiative, said Australia's target could have significant implications for the Paris talks. "We'll be closely watching what their rate of decarbonization will be after 2020, especially whether they keep pace with the U.S. and E.U. It will be extremely disappointing if Australia's contribution is clearly behind that pace," he said. Several activists said the Abbott government is considering a range of targets from as low as 15 percent below 2005 levels by 2030 all the way up to 35 percent. The higher end would somewhat approximate the U.S. offer of cutting carbon 26 to 28 percent below 2005 levels by 2025. Speculation about the final decision has run the length of the spread, but most realists are expecting to see a target at the low end of the range. Meanwhile, environmental groups also have been pressing the Australian government for a 2025 goal but admit they are not hopeful. "At this stage, the Australian government have indicated they are looking to be in the 'middle of the pack' and are likely to sit somewhere between Canada and the U.S.," said Kellie Caught, national climate change manager for the World Wide Fund for Nature (WWF) Australia, in emailed comments. She said the Australian government over the past two years has played a "defense, obstructive and disinterested" role in global climate negotiations. On the other hand, Caught also said she has detected a "slight shift in attitude" this year with the delegation instructed to support a deal. Connor agreed, saying, "They can bugger things up pretty massively if they get a mandate." But, he said, "They're not in sabotage mode at all, from what I hear." Others, like Blair Palese of 350.org Australia, said they remain suspicious of how Australia will handle itself in the Paris talks. Palese said she expects the government to be a "disrupter" that will be "not arguing for nor participating in the setting of ambitious targets and is likely to commit to something that can pass for a commitment but means we do nothing at home." Meanwhile, activists insist, the Australian public wants to see the country act on climate change. An annual poll conducted by the Climate Institute and released yesterday shows 59 percent of Australians believe the government has underestimated the seriousness of climate change and 63 percent want to see the government take climate change more seriously. That's an increase of 6 points from last year. A full 71 percent agreed with the statement that "it is inevitable that Australia's coal-fired generation will need to be replaced," while 5 percent disagreed. Connor pointed to the polling as proof that the country wants movement even if the government does not. "Don't judge a book by its cover," he said. The deputy leader of the Australian Greens, Sen. Larissa Waters, blasted Abbott for making Australia "the only country in the world to lower our renewable energy target and to scrap a price on pollution." She called on his Coalition government to change course in deciding upon the Paris targets. "Not only is Tony Abbott ignoring the science and snubbing the rest of the world, he is completely out of touch with most Australians, who understand climate action means new jobs," she said in a statement. "When the Cabinet meets today, it should prioritise the two thirds of Australians who want climate action, instead of mining company donors," she said.